As you all know, I am doing a series of reviews of the ESET Smart Security 6 program, and today I am talking about safety and protection. Like a lot of you, I have a smart phone, a laptop, a PC and a tablet–all of which are used in my personal life, as well as for my livelihood, everyday. So making sure my online activities are secure is very important to me. It’s so easy to forget that what we do on Facebook and Twitter, and carelessness can also leave our devices vulnerable in ways we probably haven’t even considered. So, here are some of the ways the ESET Smart Security 6 program protects us on social media. The Social Media Scanner protects your profile from malicious content by providing Facebook security scans of your wall, Newsfeed and private messages. ESET Social Media Scanner protects you even when you’re not logged in. If the scanner finds a problem, you’ll be notified via email, so you can take immediate action. The scanner also checks your friends’ walls for potentially dangerous links (and if it finds anything, you’ll receive a notification of that as well). With the ever-evolving integration of social media into our lives, this scanner functionality is a must-have–to protect you, your friends and family! As a next step, you’ll also want to take a look at this article: Five social posts you should never click. You’ll find helpful tips on protecting your Facebook profile, including step-by-step instructions: How To Secure Your Facebook Profile. Don’t give too much away… Be aware of how much info. (about yourself, your life and your family) you’re giving away in your Profile. Too much information really can hurt you (those details give identity thieves easy access to personal facts and figures, which could open you up to devastating security risk)! Remember, your friends and family already know where you live, your birthday, who your family and interesting facts about your life. 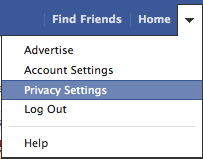 Keep your private stuff private… Facebook allows you to quickly and easily update your settings–to protect your privacy. Take advantage of the settings. Don’t let just anyone view your list of friends, and all your content. You can read more about how to keep your data private here. Who can access your personal data? 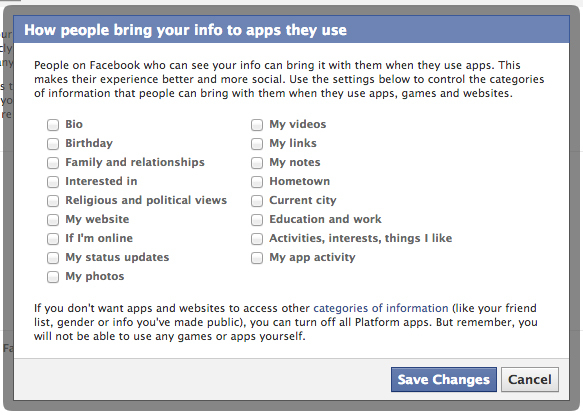 Here, Facebook allows you to control what details about you that third parties can access to your Facebook profile. 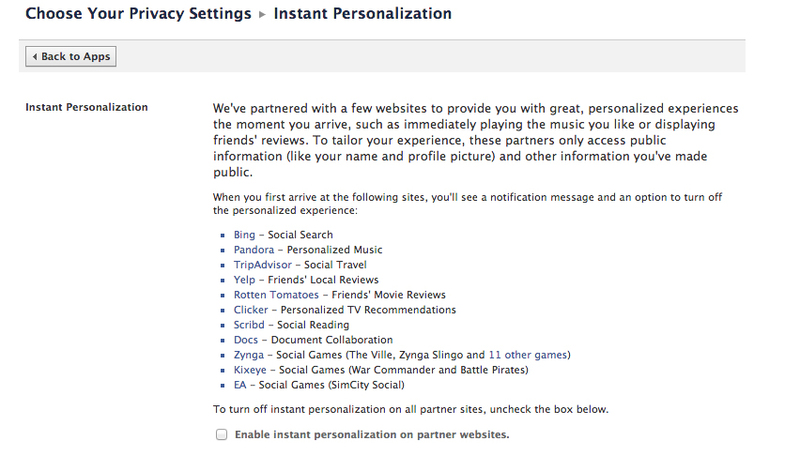 You’ll notice that Facebook has nearly all categories ticked by default. Decide how many apps you really need, then de-select the others. To personalize o r not to personalize. Potentially this partner personalization is a good idea, but it also means that you’re sharing data with big corporations. If you don’t like it, de-select the “Enable” box. Hide yourself from Google searches. For the most part, you can leave public search turned “off” (unless you have a commercial Facebook page. Pesky adverts! If you’ve ever “liked” an organization or commercial brand, the default setting is to allow that organization to use your name and picture in Facebook ads that run on the right hand column of Facebook pages. You can turn off this default setting, as well as control what Facebook calls “third party apps,” those organizations that have your permission to use your name and photo in the future. And finally, a Facebook friend is not forever. Think about the actual “friends” you really want to connect with. Pruning of your “Friends” list is a good idea every now and again. Also, DO NOT publicly announce vacations or other absences on Facebook and use Facebook email to communicate directly with friends. Social-media security and safety is obviously one of the biggest concerns, but mobile security is becoming just as important (if not MORE SO). And, that’s where one of the coolest features of ESET comes in: the Mobile Security For Smartphones application and the anti-theft settings. To me, they are worth their weight in gold. As I mentioned before, I’m thrilled with this program–based on their Customer Service alone. The more I use the program, and the more I see the many security features it offer, the more I love it. I feel confident that it is an effective way to protect my family online, and it also protects all my data and devices. You really can’t go wrong here. The giveaway will run from October 1-31. Open to US/CDA. Random winners will be selected and will be shared with you. Prizes will be given to 7 lucky recipients. GRAND PRIZE: Android Tablet (choices below) – preloaded with an ESET Security System. Don’t forget to check out the ESET Facebook page or follow them on Twitter–for more information and resources. As a reader of DaddyNewbie, you’ll receive a 15% discount on ESET Smart Security–just click on the banner below (promo code=”PTPA”). We spend a lot of time online, work in IT and manage websites — obviously security is important to me. I really do like this program. The customer services alone is worth it, A+ in my book.